I am beginning to understand this. Since December of last year, I have been going through what? An initiation perhaps? Something. I have been so afraid. Last year, Love showed up at my door and said, “Here I am. Take me.” At first, it was a dream. I was in a bit of shock…too much shock to muster up much resistance. I was still in the joy of the miracle. 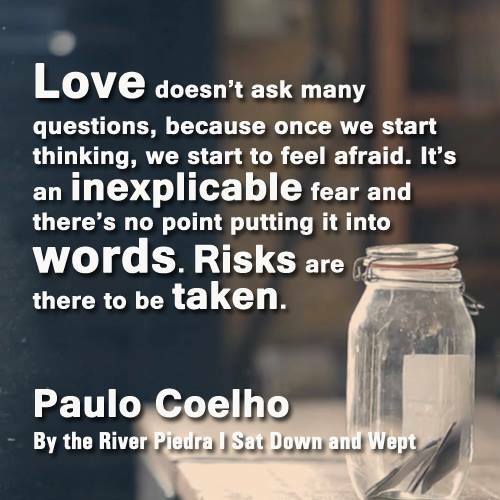 When reality set in, when the changes I was facing became clear, when I began to realize (or my mind began to convince me) that I was losing everything I knew to gain a big question mark, a huge fear entered the picture…that very same inexplicable fear of which Paulo writes. Of course, I gave it explanation because I couldn’t bear the inexplicable. I gave it a name and face and whatever else I needed to feel safe. And without even realizing it, I made this illusion, this golem, my partner. I invited it in and had conversations with it. I allowed it to counsel me, and I took its advice. But I didn’t know what I was doing. I was talking myself out of a dream. I was squeezing the life out of my vision. To feel safe, I was posing every scenario, every possible negative outcome, every excuse not to change my life. I was waiting for the next step to appear because I wanted less risk, more assurance, certain non-negotiables in place. I was overhashing decisions, considering and reconsidering every angle. I started to doubt what I said I wanted. I was creating the timeframe and locking myself into it. Since it wasn’t happening in my timeframe, I interpreted that as “it’s never going to work.” The instant I believed the lie that I couldn’t have what I wanted, I no longer knew what I wanted. I became confused. Everything became so much more complicated than it really was. I was trying so damn hard to control everything. And it was all me! I was standing in my own way, pushing away my own dream! Somehow, I woke up from that. Somehow, through grace and inner work, I managed to see that it was pointless to allow fear to make my decisions, to keep me frozen in place, terrified of what might be waiting for me. Fear was robbing me of my ability to dream! It was filling me with rigidity and confusion. “A has to happen first. Then B has to be in place. Then C must be ready to go. Then D has to align. The E has to happen.” But what I was being asked to do was step toward what I wanted, no questions asked…no promises…just faith in my desire. Stuart and I have been waiting for my house to sell since October of last year. We’ve also been waiting for him to find our new place in France. We’ve been waiting for finances to improve. And with each passing day, waiting has brought more waiting. Waiting. For what? Nothing. I really thought we had to wait. But the only thing I’ve been waiting on is for FEAR to leave the room. I could have been waiting forever. As soon as I resolved to move forward, I felt such a weight drop from me. I felt elated. I felt on-track. We both felt a lot less stressed out. I got calls for two showings to the house less than an hour apart (and two more today). After weeks of moping around not knowing what to do next, the next steps became obvious. We’re no longer waiting. I’m leaving for France at the end of next month. We’ll make due where he is and look for our new place together, and my house will sell when it sells. In the meantime, I will LIVE LIFE! I will step toward that which fills my heart with song even though my boots shake. Risks are there to be taken. Right, Paulo? This writing fills my heart with joy recognized! So happy for you and Stuart and your brave inner journey that culminates in all possibility. You are speaking to me, yet again, dear friend. Thank you. Thanks for being happy for me, Kat. Here’s to joy!